Co-curricular programs are defined as those activities that enhance and enrich the regular curriculum during the normal school day. 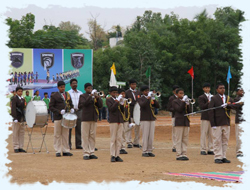 Co-curricular programs are defined as those activities that broaden the educational experience which usually take place beyond the normal school day. 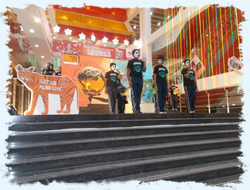 These activities at Anan are a part of the curriculum and mandatory for all the students. 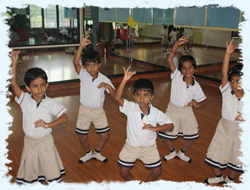 The basic steps of western dance is taught and also the theme is integrated with the western dance curriculum which provides more understanding about the concept in a fun filled manner along with the development of physical and gross motor skills. The basics of Bharatnatyam is taught which aid in development of rhythm and coordination and also development of fine motor and gross motor skills. Yoga is a familiar component of our Kindergarten curriculum. Learning yoga at a young age can be instrumental to a child’s social, emotional, physical and cognitive development. We offer yoga classes that expose children of all age groups in a manner that they can understand and also age appropriate. Our music curriculum focuses on children learning basic notes on the keyboard which develops the child’s fine motor skills. 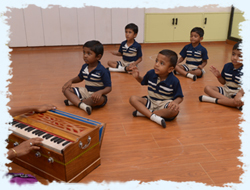 Students are also introduced to vocal music where Indian music, songs, bhajans, carnatic music are taught to them. 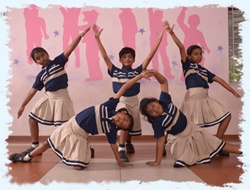 The western dance curriculum has been designed having a holistic approach towards the different art forms. 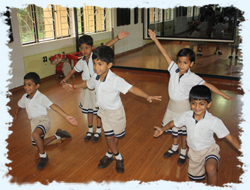 As a part of the school curriculum it also provides coordination of movements, exposure to different dancing styles, and also a sense of rhythm. Yoga improves stamina, fine and gross motor skills and dexterities, self-awareness and control, and coordination. 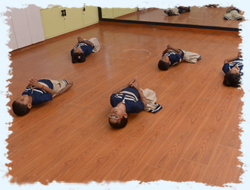 Yoga is taught to the students in the form of exercises (asanas) and also meditation which also helps in overall development of the child and contributes towards flexibility and muscular fitness and also corrects postural defects in children. The Martial arts are fighting skills developed over the centuries. 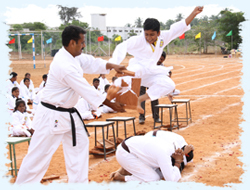 Children are encouraged to practice these fighting skills to learn the art of self defence. It also helps to produce a disciplined mind as well as a healthy body. 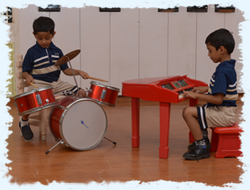 The basic notes and songs are taught on the keyboard to the students for grades 1 to 5. Also students above grade 5 learn at least one instrument, taught by a team of experts. 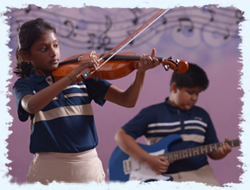 All the standard orchestral instruments like keyboard, drums and guitar are taught to the students. The school has separate and independent Drum and Pipe Bands and they steal the limelight during the Sports Day celebrations and other important school functions. These units are administered and trained by professional band masters. The students learn to play these instruments from Grade 6. Outward bound learning has been a part and parcel of the school’s ethos. Scouting and Guiding is a Character Building Educational Movement that changes young mischievous lads into fine men, not just physically but in mind and soul too. 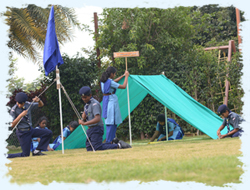 Cubs and Bulbuls activities are conducted for younger children. These children’s aim is to help others and make them happy. All activities are organized in group system. These children take the promise and do a good turn every day. Anan is proud to be a part of the International School Award which is an International knowledge exchange programme, where students will have a wide opportunity to experience internationalism in every activity and also interact with the students world-wide.